We are certainly feeling blessed this summer with all the wonderful weather. In the midst of one of the warmest seasons in years the vineyard is looking the most productive it ever has. The sun has shone for weeks and the occasional shower has provided the perfect amount of water for the vines. Across the whole vineyard, there are beautiful grapes galore, getting plumper and ever closer to an early harvest. Whilst the fields in Devon and Cornwall became scorched with the sun, the vines lapped up the extra sunlight creating row upon row of loaded vines. Two weeks early, the process of the red grapes changing colour is currently taking place (Veraison). 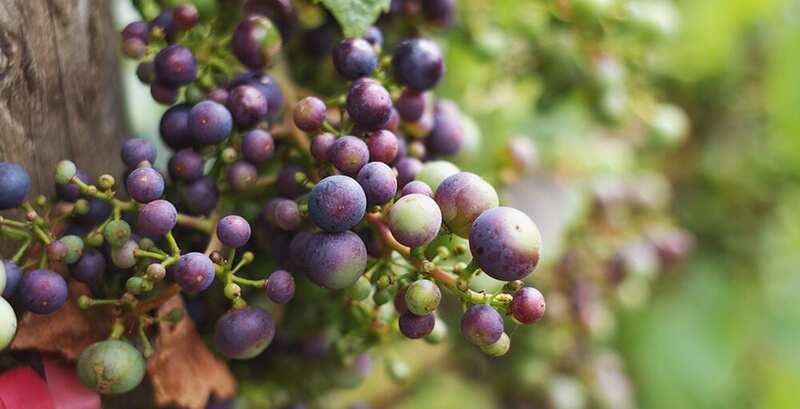 All grapes start the season as small green berries and at this time of year will plump out and change colour. The white grapes become a softer more translucent green and the red skins of the red grapes will appear. The wonderful weather hasn’t just been great for the vines. Over the summer we have visited a number of fantastic, sunny agricultural shows and markets. Launceston show is always a great day and joining Okehampton Show, for the first time this year was a real treat. Harvest 2018 is soon approaching and our estimation is that we will be picking in late September. A few weeks earlier than our typical harvest. To visit the vineyard and to see the grapes for yourself, why not book on to one of our Tour and Tasting Experiences by clicking here. A Tour of the vineyard will include a walk through our 4000 vines. This will give you a glimpse of how the vines and grapes are grown through the year. Following your walk, a full tasting of the current vintages will take place in the shop. You can also browse our range of local produce and gifts.